Global Cloud-Based PR Solutions Leader. 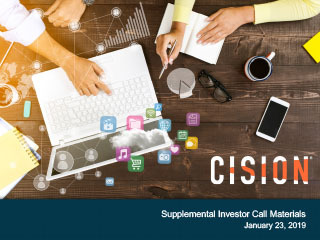 Cision is a leader in the $3 billion communications intelligence software and services market. Much like other SaaS solutions transformed finance, HR, sales, & marketing, Cision is a go-to global SaaS platform - Cision Communications Cloud ™ - for communications professionals and is transforming the corporate PR function with a comprehensive end-to-end product suite including distribution, media monitoring, media database and media analysis. Compelling Market Opportunity. The proven success and compelling ROI of earned media to build brands in recent years, combined with the declining efficacy of traditional paid media advertising, is driving CMOs to shift their focus and marketing budgets toward earned media, thereby expanding Cision’s market opportunity beyond PR software and services to include the $32 billion marketing software and ultimately the $195 billion(+) digital marketing and data markets. Industry Standard Platform Poised for Significant Growth. 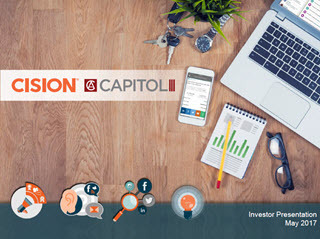 Cision with the Cision Communications Cloud™, is a reference platform for earned media. With an increased focus on influencer and audience data tracking, the Cision Communications Cloud plans to deliver valuable analytics on end user reach and engagement, and ultimately attribute purchase data back to key sources.